Kokomo, Ind. — Imagine taking a college class where you can literally drop in and fly over campus to your classroom, all from the comfort of your own home. 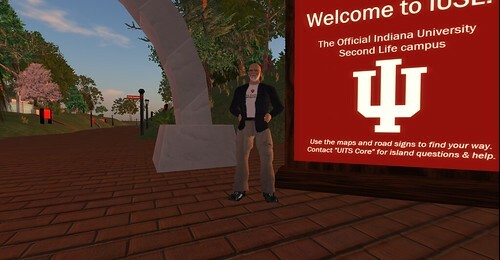 Professor Gregory Steel next to the entrance of IU's Second Life campus. That is possible in Gregory Steel's philosophy of art class, which he will teach this fall semester in a virtual classroom on the Indiana University "Second Life Island." Rather than meeting on the IU Kokomo campus, students create avatars, or virtual representatives, and log in to move their avatars to the virtual classroom. Steel is the first and only IU professor to teach in Second Life. He combines the virtual classroom with Skype, e-mail, Oncourse and Facebook, which he says makes him better able to meet his students' academic needs. "This approach uses the many ways students want to learn and get information," Steel said. "I have found the students are more engaged in their learning because there is more room for interaction than in a traditional online course. This offers the flexibility and convenience of an online course, but still allows for a significant amount of the kind of interaction you find in a real classroom. We're not located in the same space, but at the same time, we are." The IU Second Life campus includes familiar landmarks like IU Kokomo's Hunt Hall and Bloomington's Sample Gates – all in an environment that crosses cartoon with real life. Unlike the real-life landlocked campuses, IU Second Life includes ocean views from most directions. Avatars, which can be customized to look like humans, vampires, robots, dinosaurs, or woodland creatures, move through the campus at a walk or run, or can even fly overhead to get where they are going more quickly. Steel first taught the virtual class in fall 2011, and found more students participated in class discussion than in a traditional classroom, which allowed him to know that students were learning what they should in the class. His avatar was the only one that could speak out loud, but students could type in their comments and questions in a discussion window to the side. Steel said that let him know if students understood what he was trying to teach. "I was surprised that almost everyone would pipe in," he said. "In a real classroom, that would never happen. I had a higher percentage of class participation than I usually would. They were actually thinking about what we were talking about in class." Tarja Harney, a recent IU Kokomo graduate, was among the students in Steel's first virtual class. She liked it not only for the convenience of taking a class from home, but because she felt comfortable contributing to the discussion without the pressure of "performing" in front of the class. "When the teacher asks a question, you don't feel like, 'Oh no, he's picking on me and everybody is looking at me,'" she said. "You could say something without worrying about what everyone else thought, because it's your avatar's comment, not yours." Student Josh Turner said he learned a lot about art philosophy, and there were "several deep and insightful discussions," during the semester. "The best parts of the class were creating a virtual avatar of yourself, interacting with other students and faculty in a virtual state, and the overall freedom," he said. Steel and many of his students created avatars that resembled themselves, while others chose to be dinosaurs, robots, cars or aliens. Each had a user name, to identify them as part of the class. Because Second Life is an open environment, nobody in the class used his or her real name, as an extra safety precaution. John Gosney, IU faculty liaison for the Learning Technologies division of University Information Technology Services, said university officials are studying how to use Second Life and similar programs to enhance the current online course offerings. He said virtual world classes improve distance and on-line learning programs by making them more interactive, and allowing opportunities for hands-on practice. He said nursing students could treat virtual patients, in a safe environment. There are also opportunities to virtually visit places that would not be accessible to them in real life. For example, he said, an archaeology class could virtually visit a dig site. Steel said with virtual classes, students could attend from anywhere in the world, and campuses can grow in population without having to grow physically. "This has infinitely more possibilities than the current standard of online teaching. I think we have an opportunity to look at something that would extend the classroom out into the world. It could become a pretty powerful tool."